Prawn cocktail is a classic 60s starter. This recipe is modified from a 60s' original. 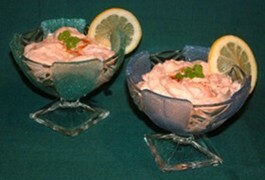 Prawn cocktail remained popular in the 70s and 80s as well. Shred the lettuce leaves or mixed salad leaves and place in the base of four glass bowls or large wine glasses. Season to taste. Mix together the mayonnaise and tomato puree and add Tabasco to taste. The Tabasco gives the sauce an extra kick - much better than buying it ready made from the supermarket. Add the king prawns. Spoon the prawn mixture on top of the lettuce and garnish with a little sprinkling of Paprika pepper and attach a lemon slice to the side of the glass.